Buddy came to us as a “replacement” dog. My daughter’s beloved black lab, aged and infirm, had been put down just as Cindy was in the throes of severe depression. We were introduced to a three-year-old miniature schnauzer as we were anticipating her return from her third (or fourth?) hospitalization, and planned to have the new pup waiting for her when she arrived home. The vet who connected us with the dog cautioned, “Now, he doesn’t like men. But he’ll be great with Cindy and her son.” And he was. The poor thing’s registered name was Pluto, which was highly inappropriate, and promptly changed to Buddy. (Our four-year-old grandson was quite fond of Walt Disney’s Air Bud movies.) Disney’s Pluto is big; Buddy was a smallish dog. Pluto’s ears are floppy. Not Buddy’s! As a matter of fact, his ears rather dwarfed the rest of his compact body. They had not been clipped when he was a puppy, as is the fashion with dogs of his breed, and he had perpetually erect antennae connecting him to all sound. And, besides, the name Buddy just seemed to epitomize the role of canine pal we expected him to undertake. We found that Buddy, indeed, was not fond of men. He regularly serenaded my husband with incessant barking whenever he entered the house. Through ten years of cohabiting they never resolved the issue of who was the alpha male. Buddy charmed us with his ability to sit upright for long sessions of begging. It seemed that his bobbed tail and healthy, broad behind provided a solid foundation for his balancing act. He developed a pattern of begging–spin around once, assume the upright begging posture, and bark sharply. It would have been nice to think that his barks were a canine expression of please, but I suspect the more accurate translation would have been, “Look at me! Treat time!” I am the softie at the dinner table, and mealtimes found him by my chair, watchfully waiting for the inadvertent or purposefully dropped morsel, and, if the bite was not forthcoming, he was not above a hushed grumbling growl, just to remind me he was there. He seemed to possess an understanding of numbers up to four. He might be soundly asleep on his bed far away from the kitchen, but invariably knew when meat was being thawed and dinner preparations started. He was particularly fond of doggy steak tartare (ground beef), and expected a minimum of four small bite size portions before retreating to a location out of kitchen traffic to observe the cook at work. We first noticed a decline in his vision. Then his hearing became less acute. However, his sense of smell never faltered! He began to lose weight, and we found several tumors under his skin and under his jaw. He seemed to lose interest in his food, and could no longer see well enough to catch a tossed treat midair. His gait became slower as his joints stiffened. As his respirations became more rapid and labored, we became painfully aware that Buddy would not survive into his fourteenth year. He never whined and never whimpered. He lost control of his bodily functions, and one could see the confusion in his eyes after he soiled the floor. My daughter said, “He looks so sad, Mom.” And, he did. The big brown eyes which once sparkled with life and enthusiasm for living became tired and weary. The vet said he had some form of cancer, probably a lymphoma, and was developing heart failure and that the end was near. 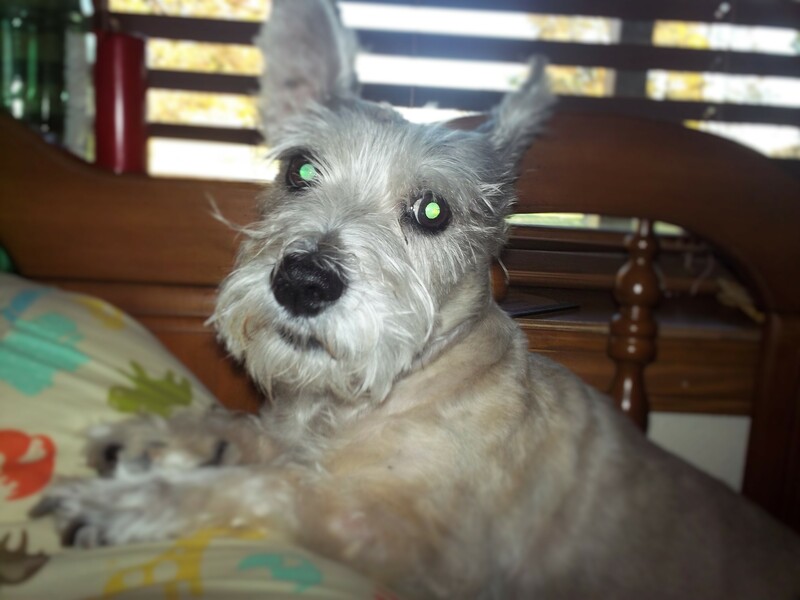 He was, after all, thirteen years old, a ripe old age for a schnauzer. And so, Friday, January 31st, 2014, we said goodbye. A dear friend who is a veterinary doctor came to our home and, as we caressed the frail shadow of our beloved pet, gently eased his suffering and released him to whatever ever after life exists for our animal friends. I choose to trust that all truly good dogs do go to some sort of heaven, and Buddy, was, indeed, a very good dog. Perhaps some of you have lost a beloved pet. If so, you understand the bond of companionship that links you together and the heartache of separation. I’d love to hear your story. Previous postI am the pencil?